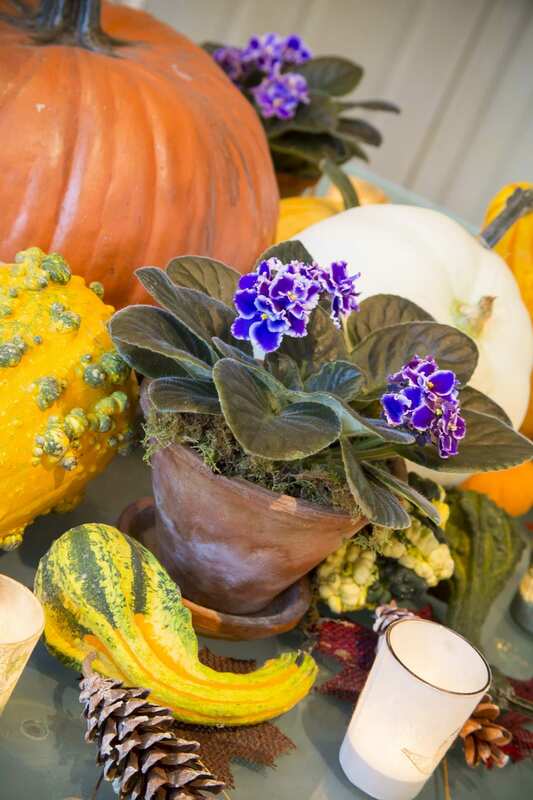 At the very end of summer, and at the very beginning of fall, you might just need a bit of liveliness injected into your garden and surroundings. 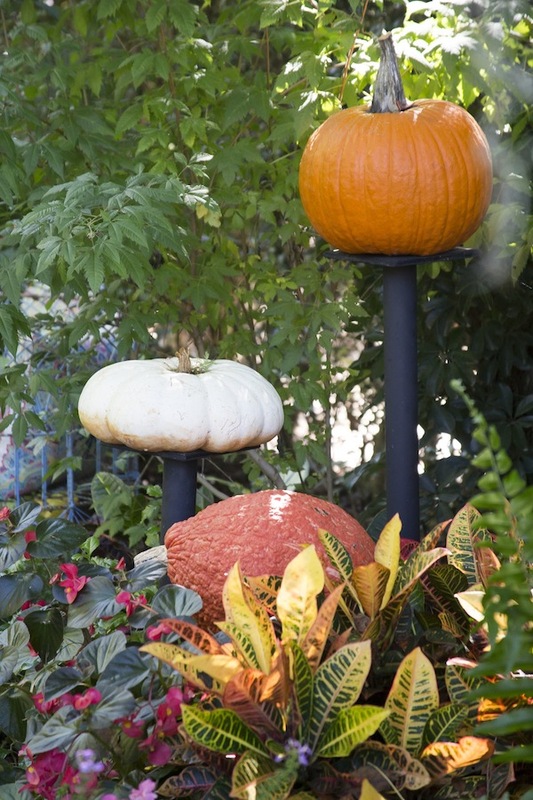 Your plantings have been vivid all summer, but are now flagging. Your interiors may also be losing a bit of their enthusiasm. 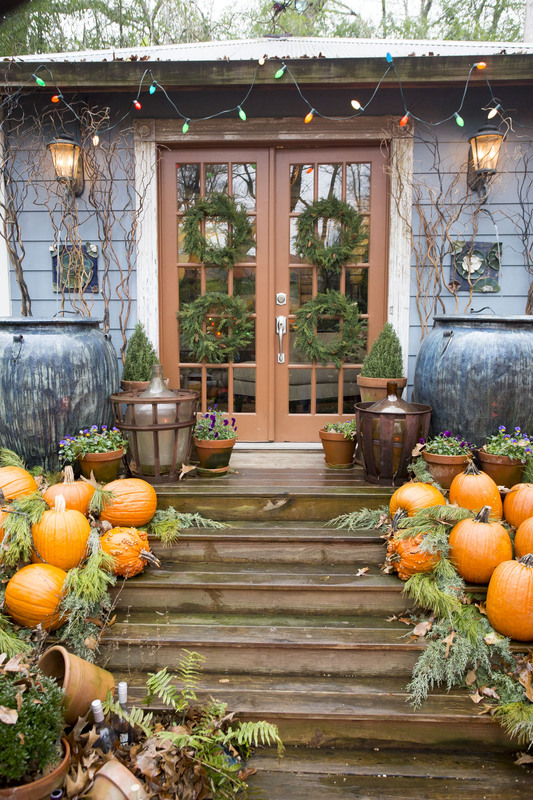 A great way to reinvigorate these areas and set the tone for the coming months is to use pumpkins, gourds, and all things orange, gold, green, yellow, warty, round, and all the shapes between. 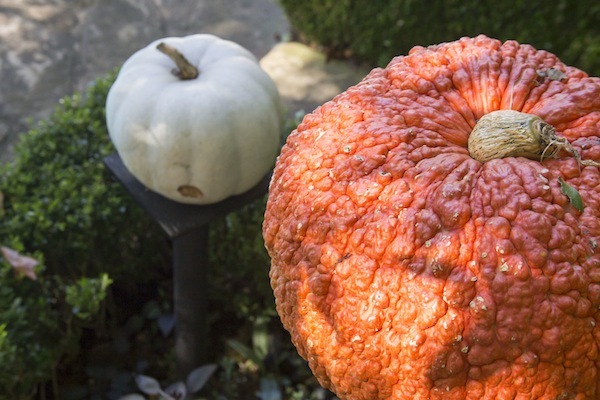 Look for unexpected places both inside and outside your home to feature this bounty you’re now seeing piled up in mounds at farmers’ markets, grocers, nurseries, and big-box stores. Look Up. 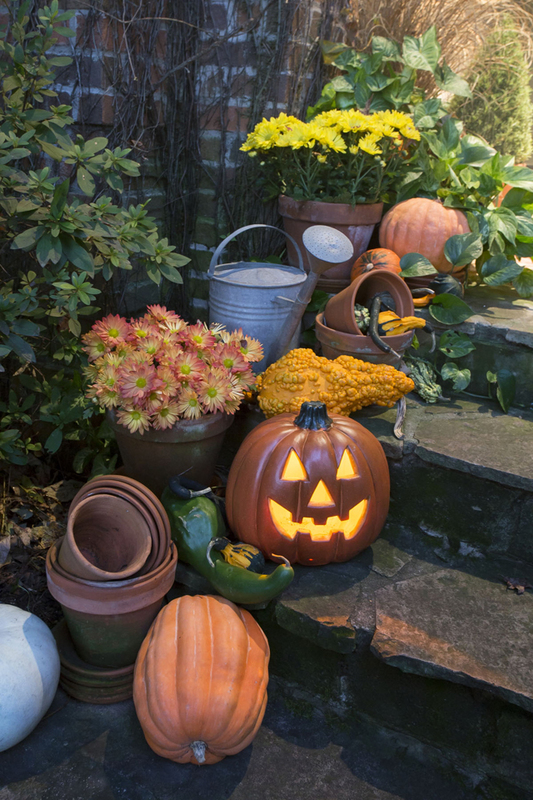 Nestle a size-appropriate pumpkin or gourd in a hanging basket, to feature with what’s already growing there. 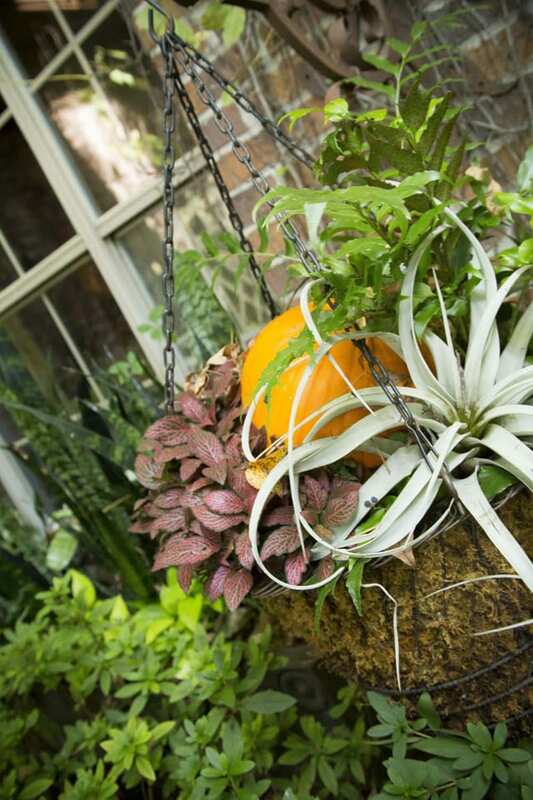 Add a low maintenance touch like this tillandsia for a bit of complementary gray foliage. Look Down. 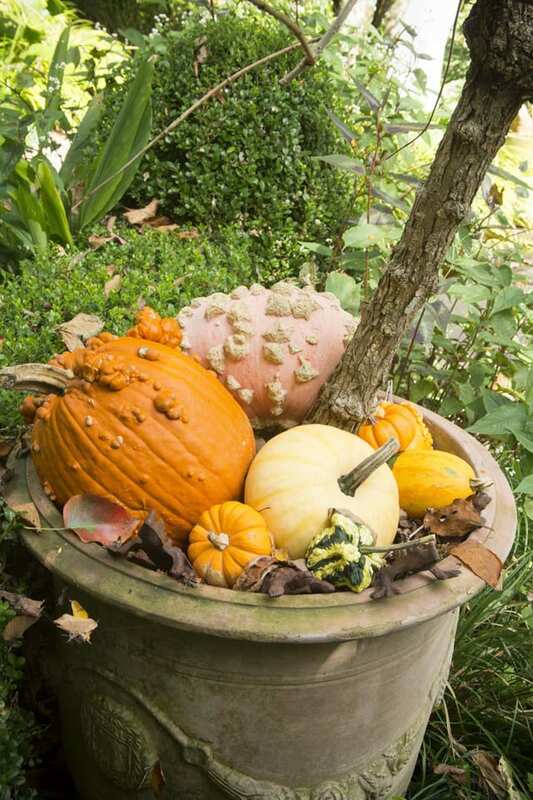 As under-utilized space is always around and beneath a plant in a large pot. The larger the pot diameter, the more you can mix. Think about color, shape, texture with your mix. Keep Moving. This one’s a perennial favorite of mine. 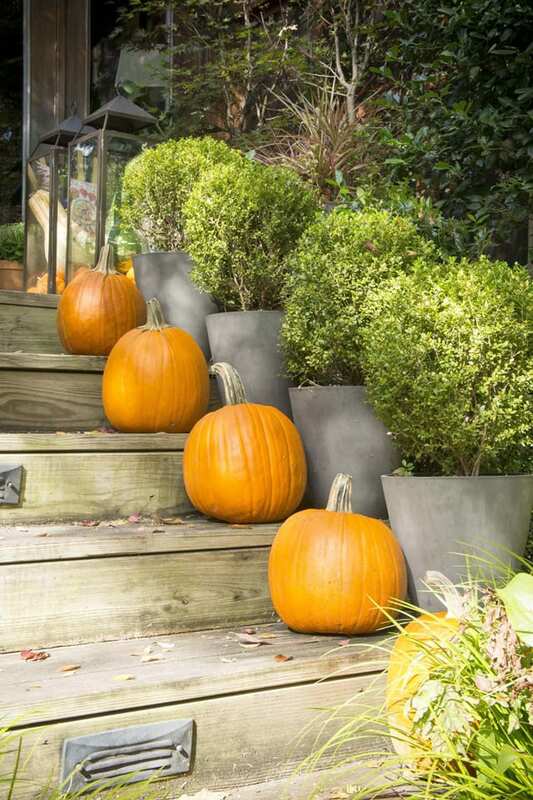 Place pumpkins in a straight line going up any steps or stairs. Works indoors or out. It’s unexpected and whimsical. And a bit geometric as well. Go With Green. 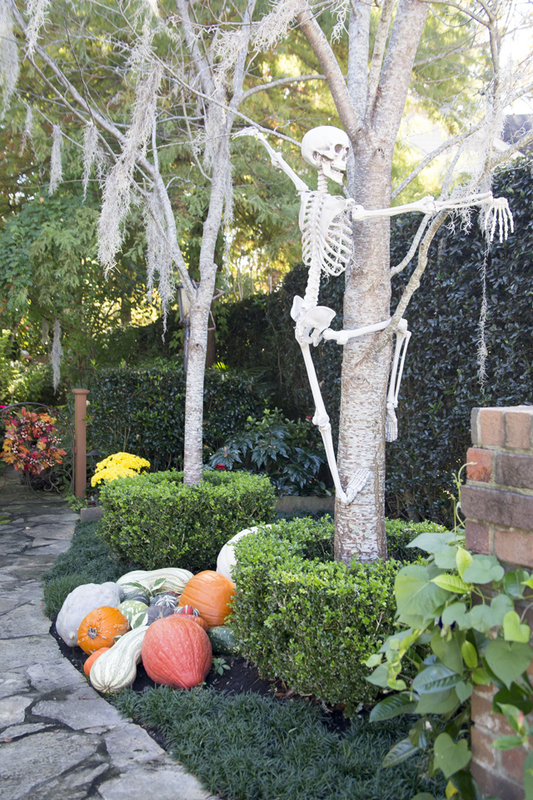 Cooler weather may be just around the corner, but you still have lots of green in your garden. 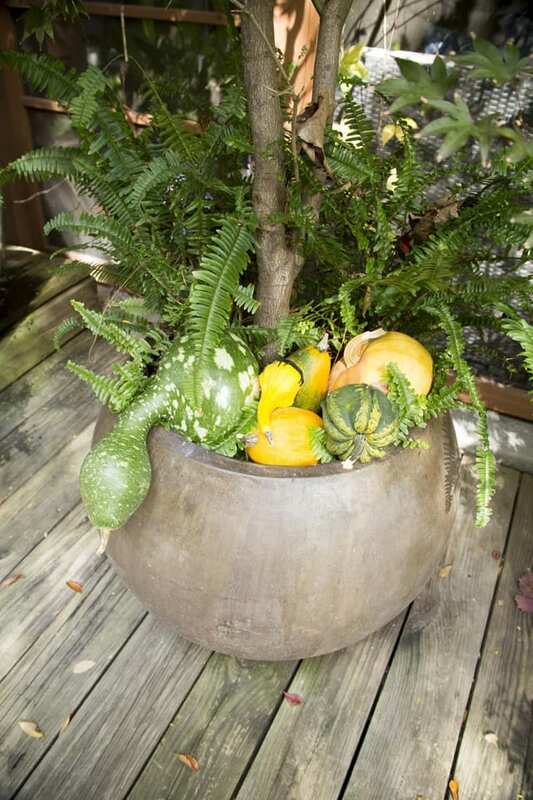 Pair gourds with deeper green ferns to get that last bit of use from this color. Warts And All. I say ‘pumpkin, you think ‘orange.’ Try to go beyond this idea. 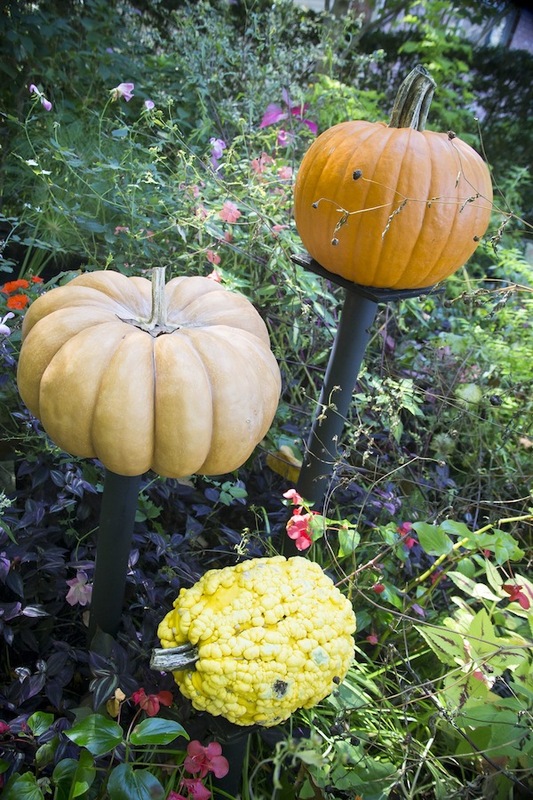 I always encourage use of texture and, with the great variety of gourds and pumpkins, you will find many variations on a theme. 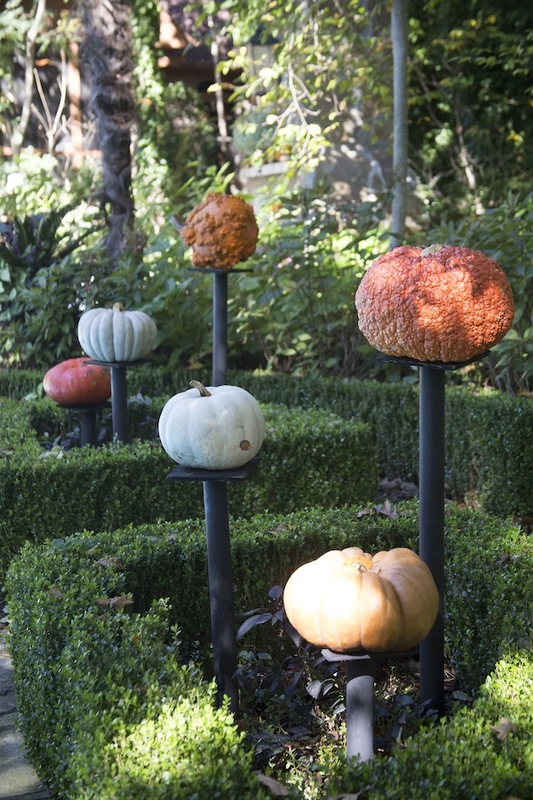 Use odd shapes, feature the stem end, and try other colors, plus bumpy fruit when you can. Light the Way. 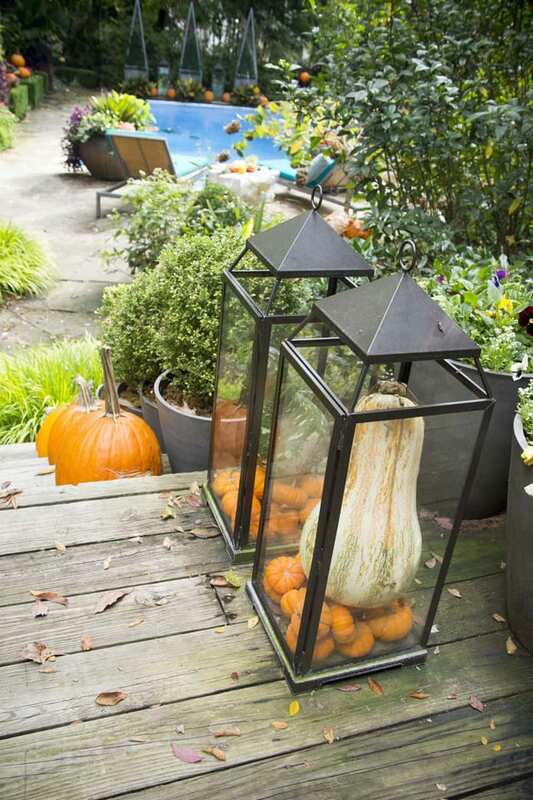 Got a big coachlight or outsized lantern? Tired of using candles in it? 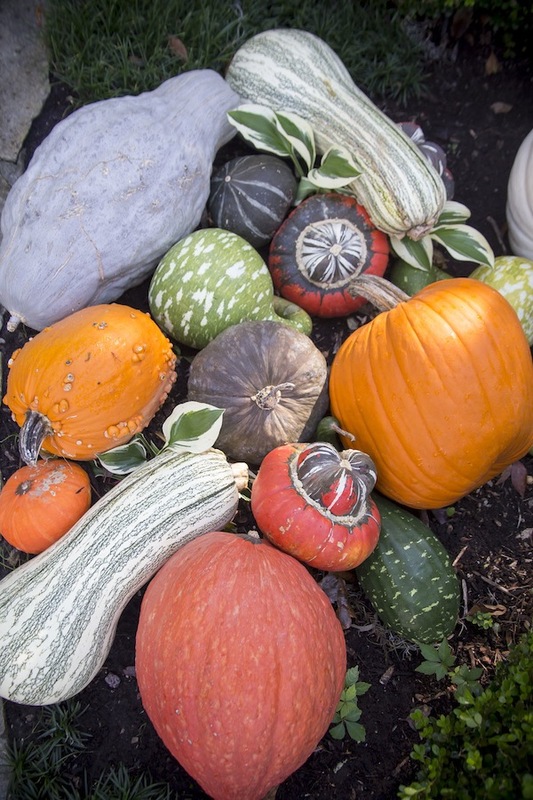 Keep the fire burning with an oblong gourd. Its shape is, of course, reminiscent of a flame, plus it fills the interior of the lantern. The bed of orange mini pumpkins the gourd rests on underscores the idea of fire as well. Superlative Serenity. 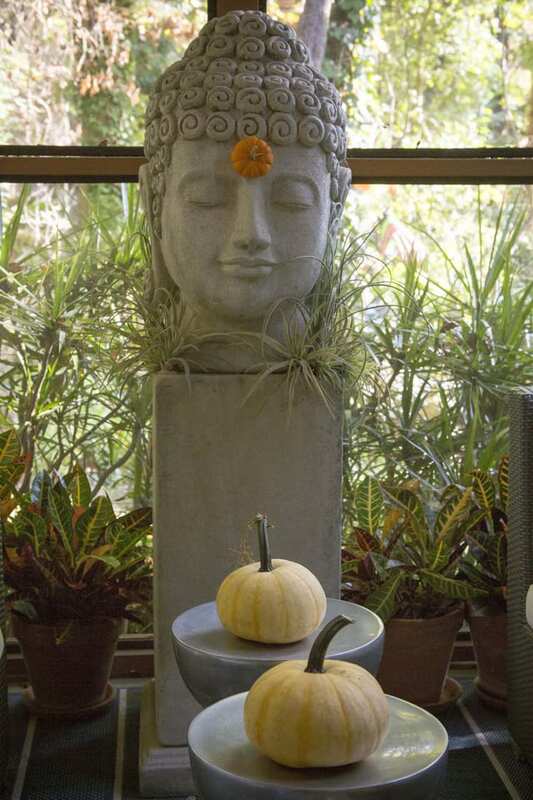 Create a shrine with pale pumpkins. 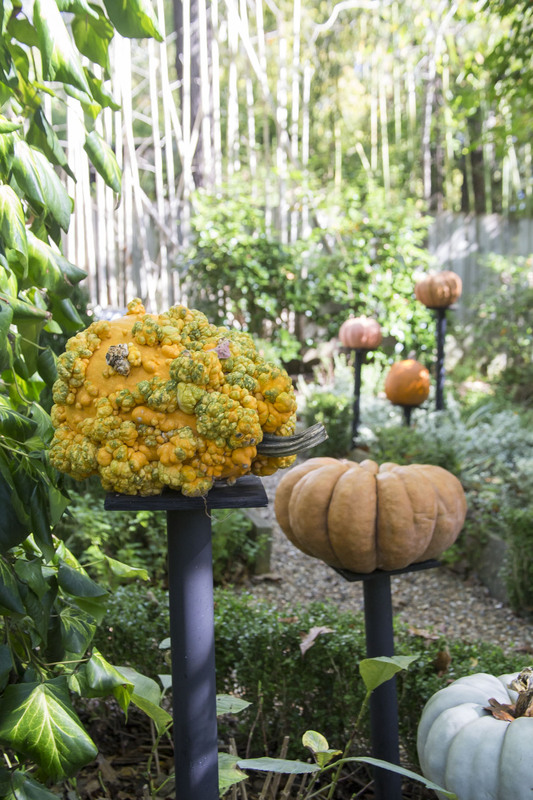 The unexpected lemon chiffon color of these pumpkins fits perfectly with the gray stone, and their identical shape and size play into the serenity of a garden goddess. 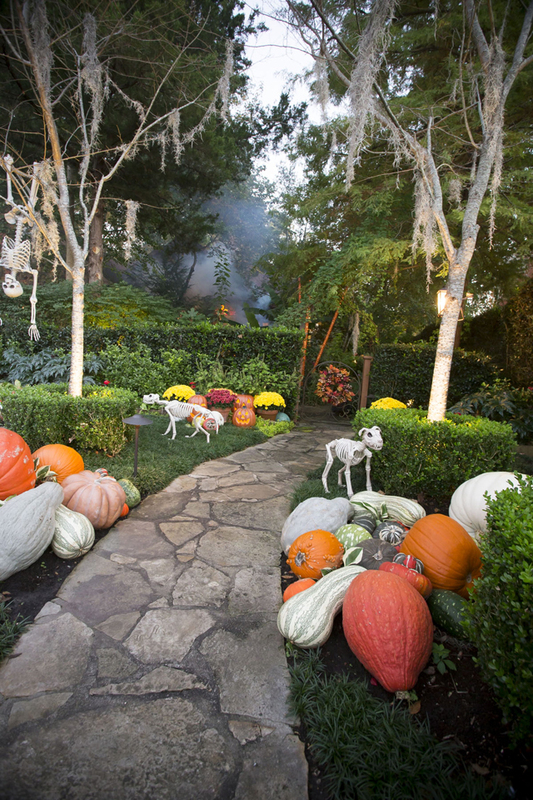 Peeping Pumpkins. 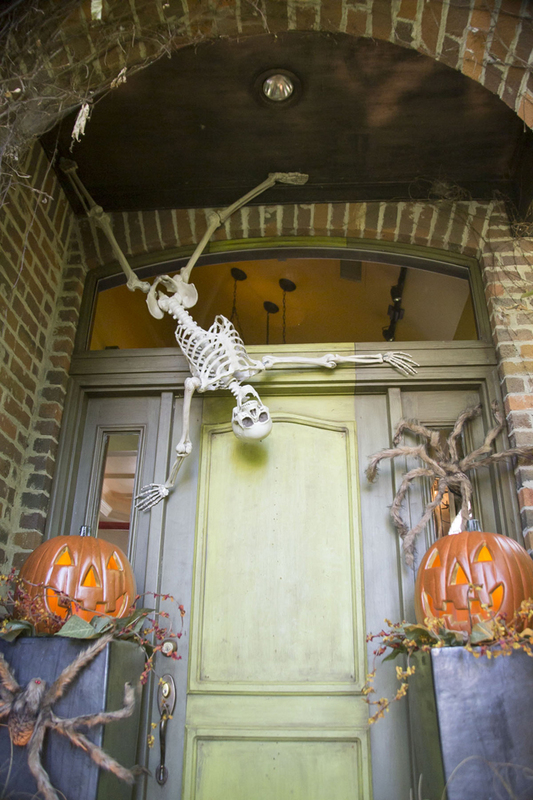 A line of three on a window ledge outside is not what your guests will expect. 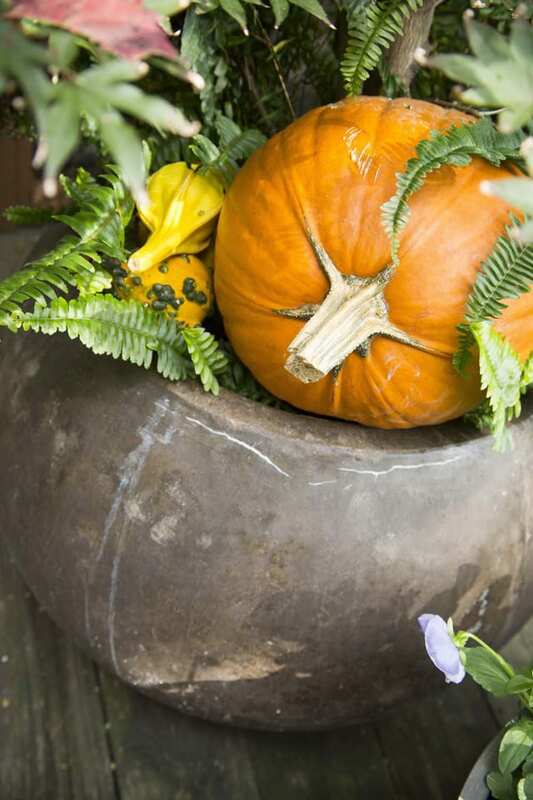 The traditional pumpkin color pops, the three stems amuse, and the effect is sublime. Nice seasonal punctuation of an area that no one but you thought about. 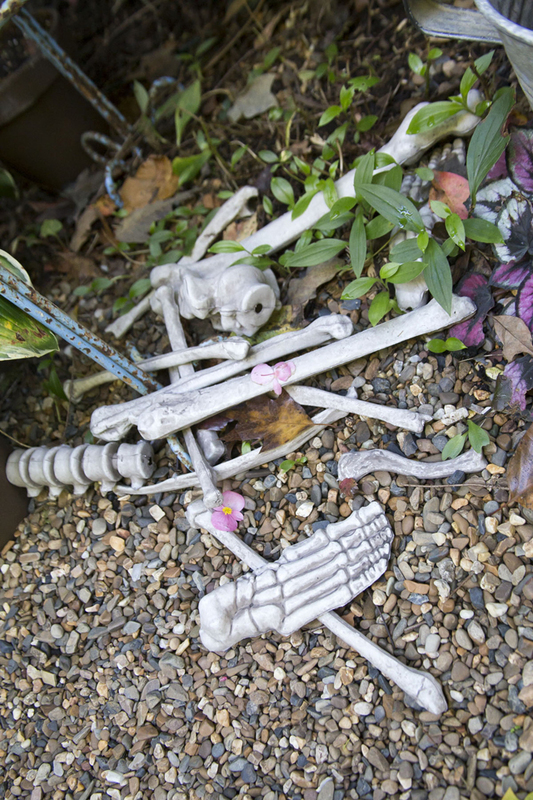 Take a look around at the underused spaces inside and out. 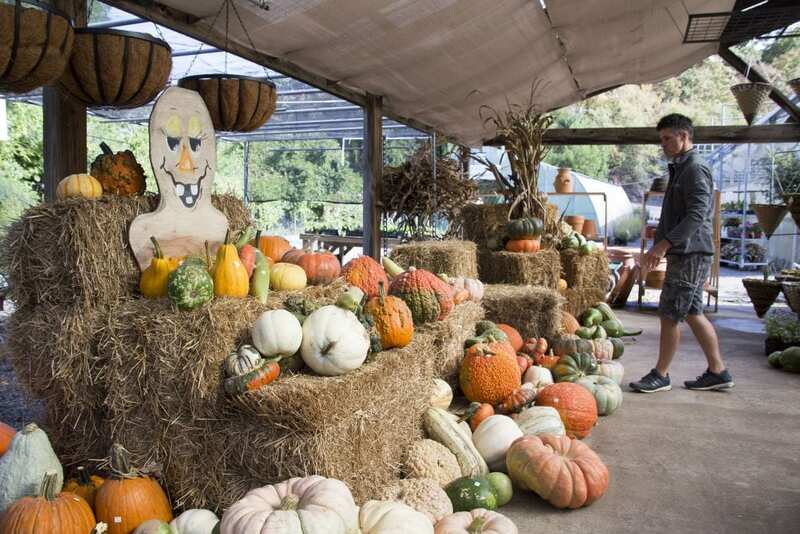 Look at all the bounty of gourds and pumpkins available now. 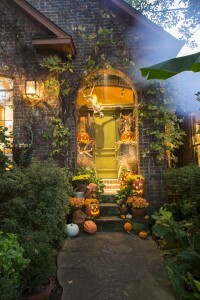 Make good use of it all, and you’ll have a happy seasonal home and garden. 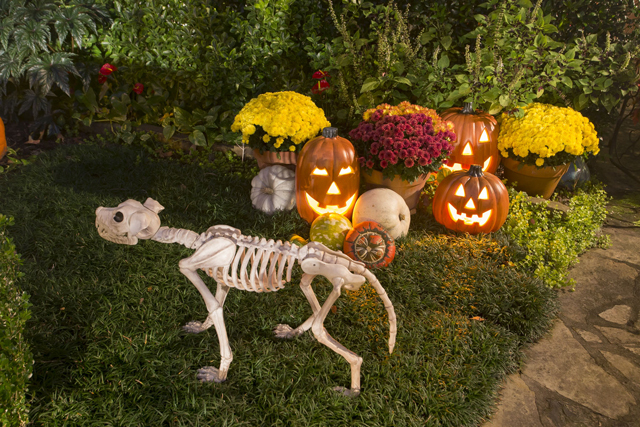 And there’s not a jack o’ lantern in the bunch. 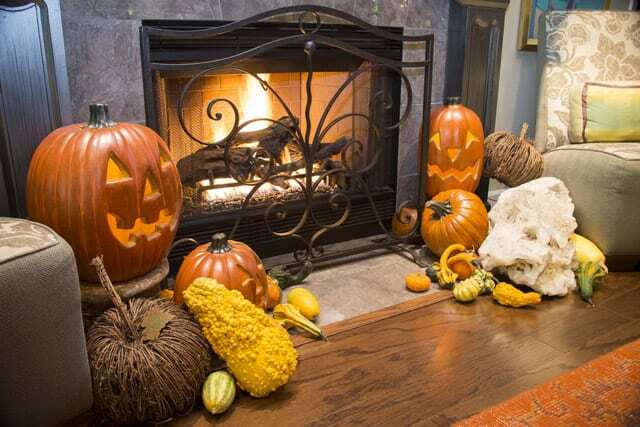 With any change of season come ideas about how to change your interiors for that season. 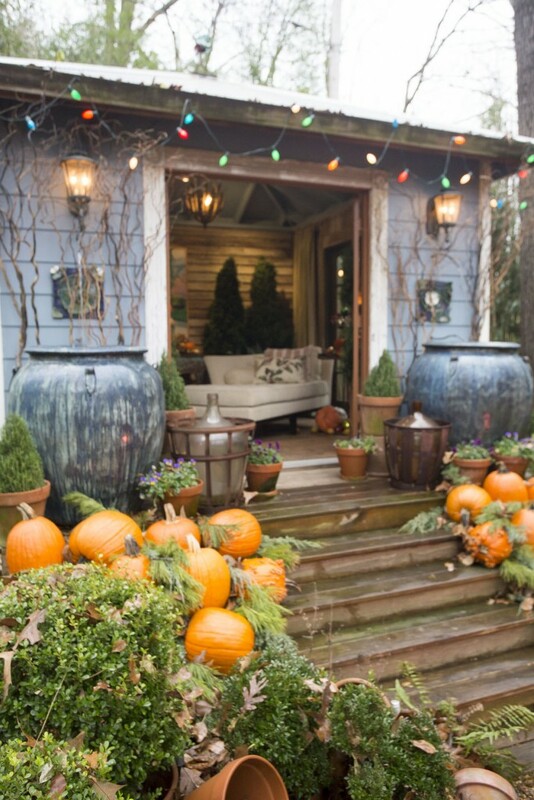 Yes, you could alter the entire color scheme of your room or house, remove pieces of furniture and haul others in to take their place, bring in yards of fabric, and empty the contents of a barn to create fall ambiance everywhere you look. 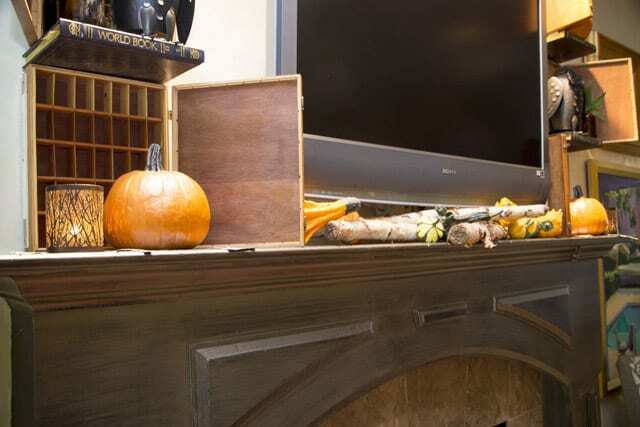 Or you can be a bit more subtle, and incorporate smaller items that still make a big impact. 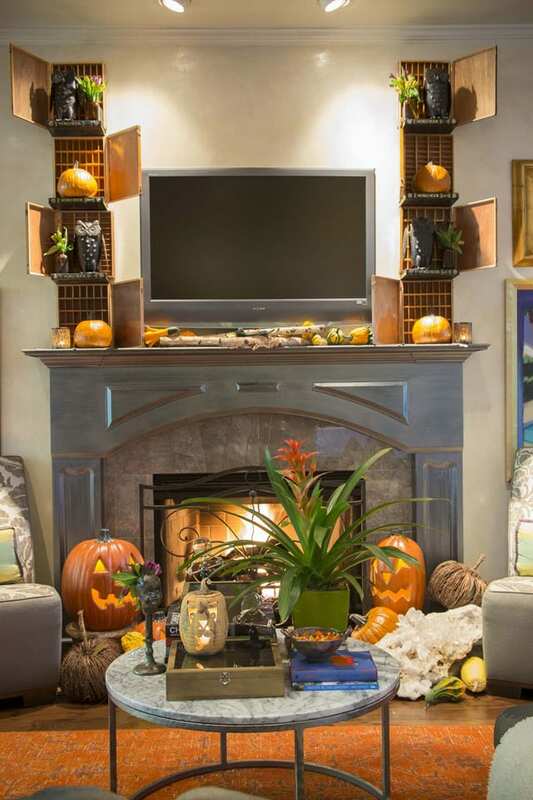 All I did was add a pair of shelving units above the mantel and pile a bit of seasonal color at the base. 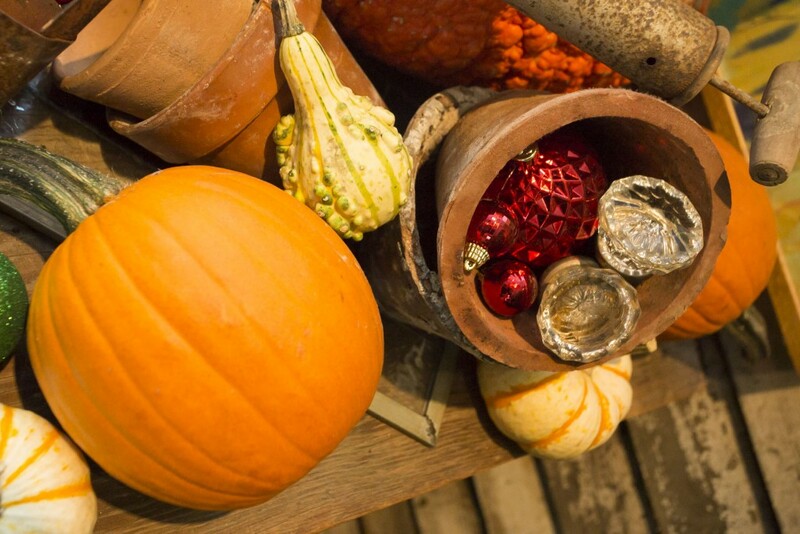 Light a fire, and you have instant seasonal display. Begin at the beginning and set up your floor display. 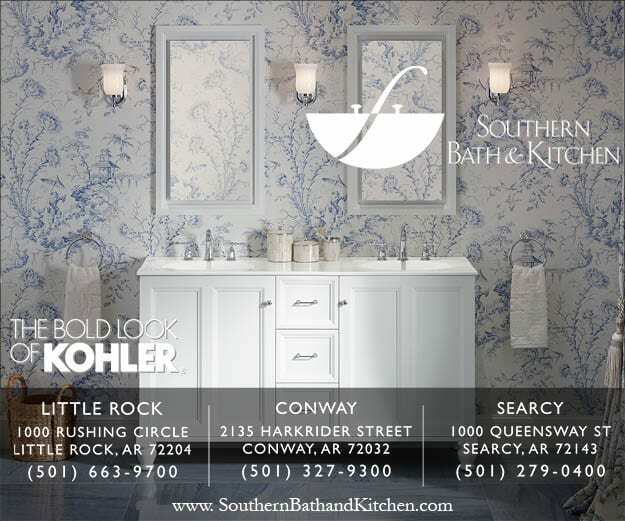 Remember to use the three elements of design: color, texture, shape. 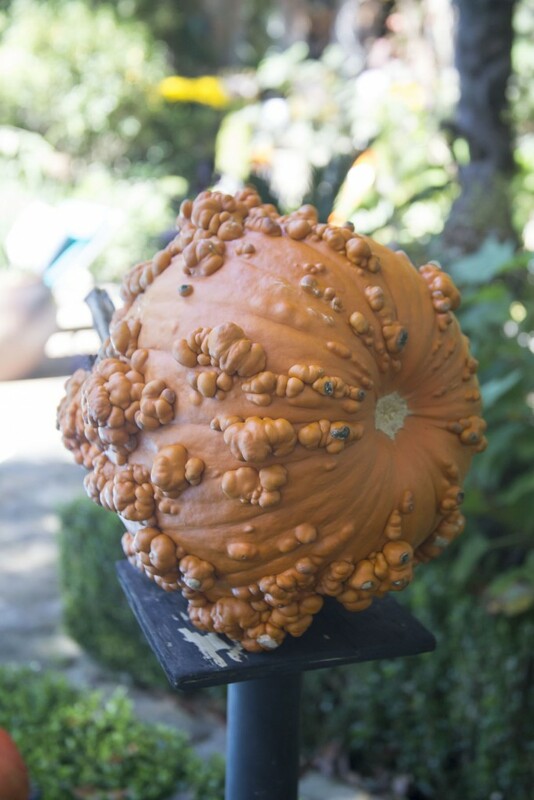 And don’t use pumpkins and gourds solely. 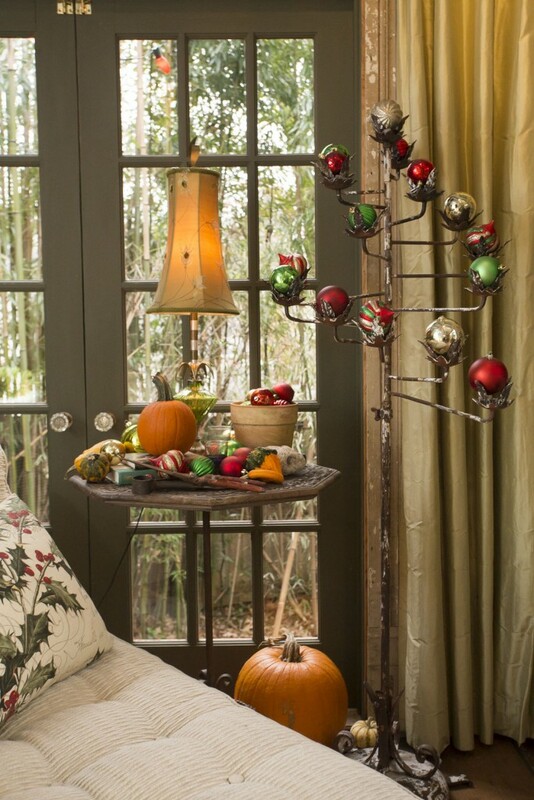 I brought in the rock from the patio and a twig apple that matches the spirit of the season. And don’t be afraid to use both real and artificial components in any display. 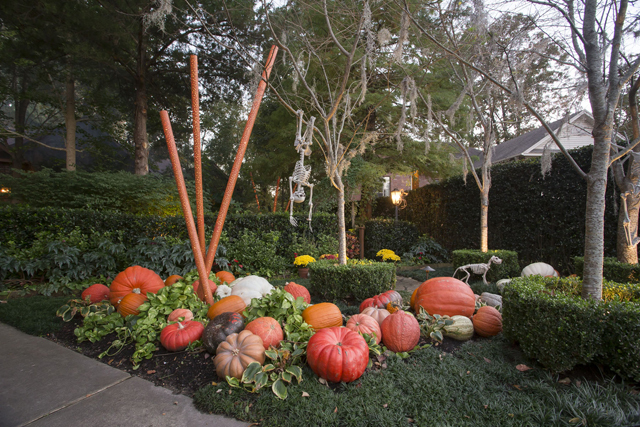 The lit pumpkins are from Botanica Gardens. They come pre-lit with an orange bulb, and are glazed, which gives them a look of elegance, but a nice touch of spookiness for Halloween. The bookshelves become a tower for the season with little effort. 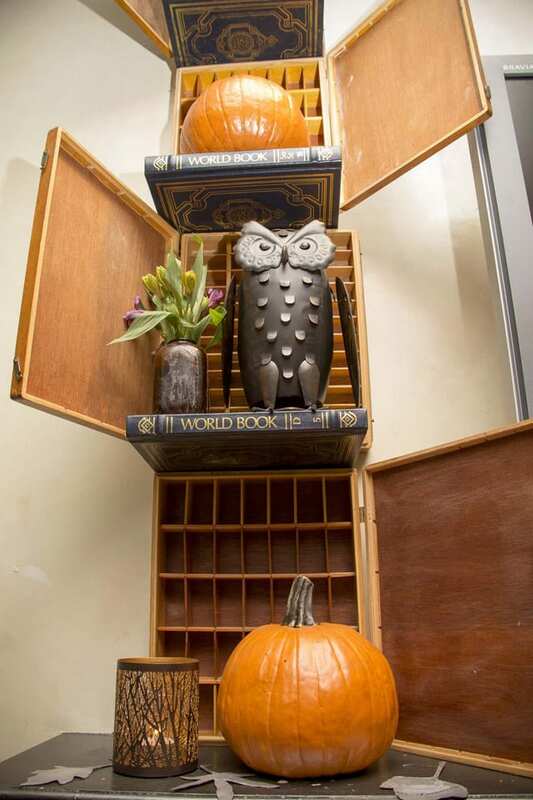 I brought in flowers in an earthen vase, an owl, a pumpkin. Three components are all it takes to represent fall. Or spring. Or any holiday. You don’t want a heavy hand. And I left all those little compartments empty. If I hadn’t, I might still be looking for small–tiny–objects to fill them, which illustrates my design point; be sparing. 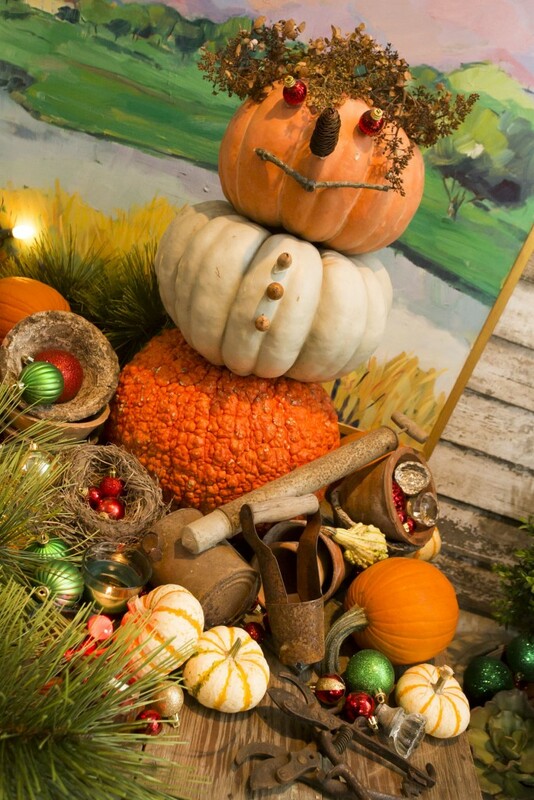 The casual seasonal mound on the floor is comprised of natural and man-made elements, real and artificial. 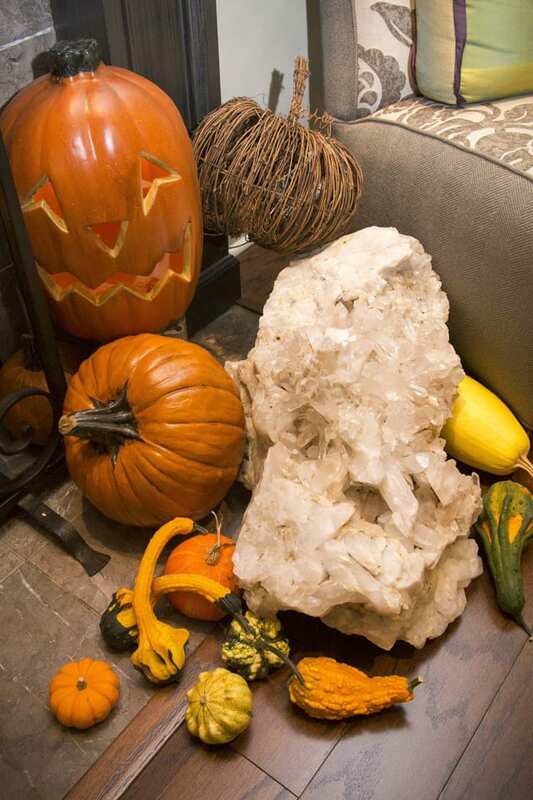 The one unexpected piece–and you should have one–is the large aggregate quartz rock. Talk about texture! 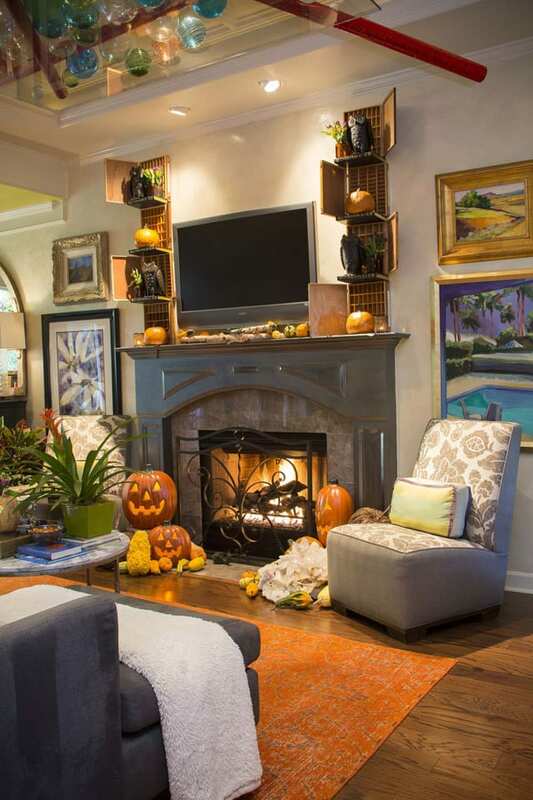 The pair of shelves isn’t clunky or overbearing, and represent fall at its best. Wood tones, a bit of color, and texture. And, because I didn’t fill this display with lots of items, the vertical lines of the shelves aren’t hidden, and echo the lines of the mantel, which makes the ceiling appear higher. I created a mirror effect by incorporating identical pieces and matching each shelf with its mate on the other side. 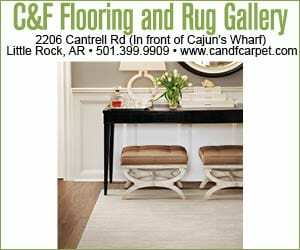 The overall look matches the room, and both the floor and wall displays use the same elements. 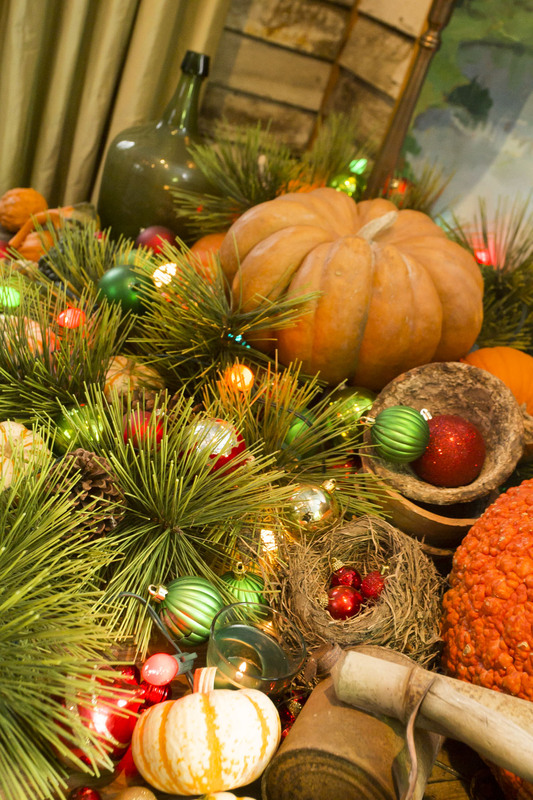 I’ve both blended my seasonal look with the existing room décor, yet created a shrine that immediately pulls the eye up. And something else to note as well. Not everyone thinks about painting the mantel silver, but use of this color makes my mantel a neutral staging area for any seasonal look. 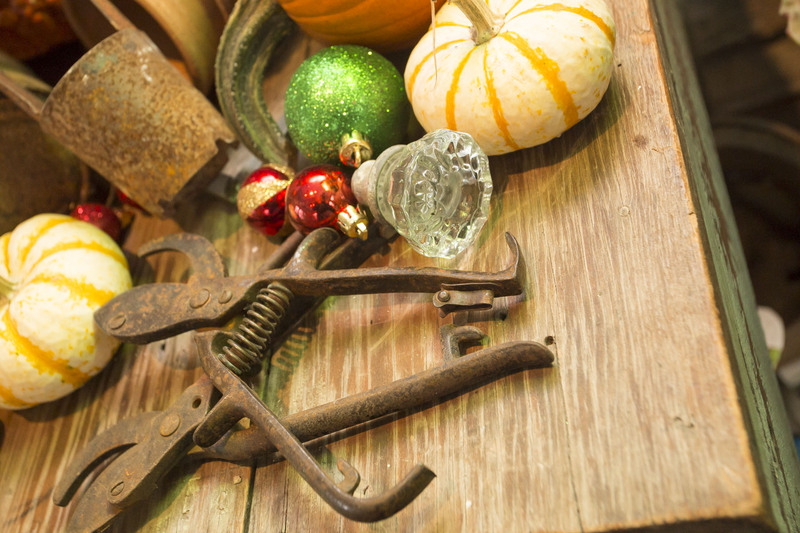 You don’t have to fill up a room with representative pieces of the season to get your point across. 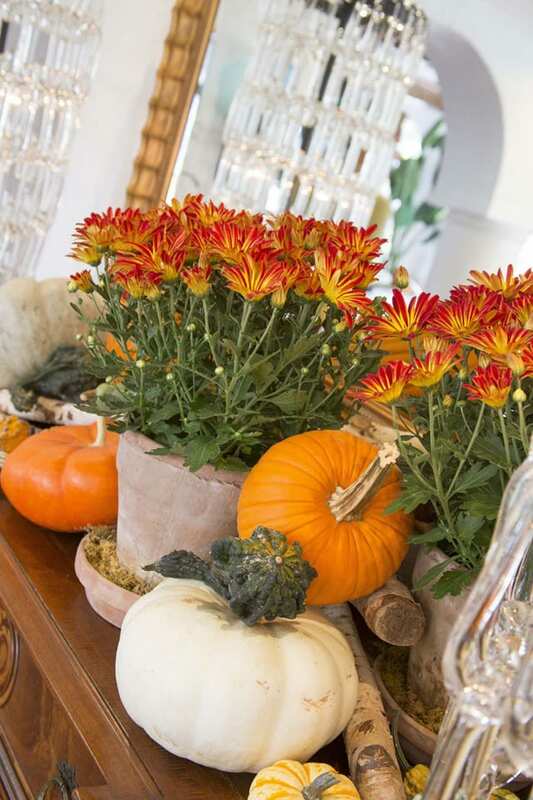 Make one slight addition, use pieces you already have, bring in some natural elements, and you’ll have a chic display, and one that conveys your personality and sense of whimsy. That’s all you need for decorating changes that will tower above.